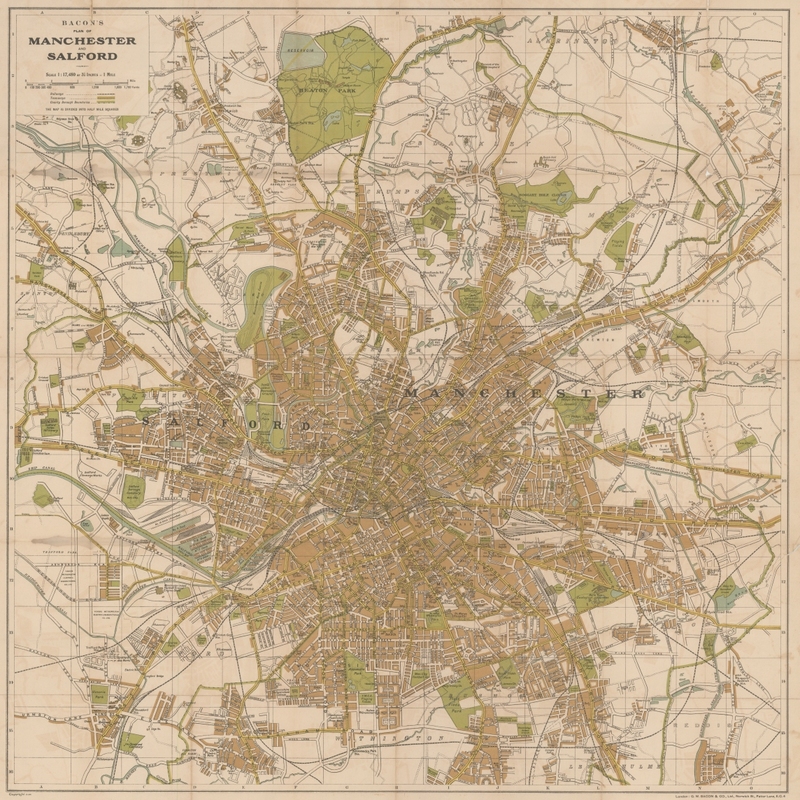 In what ways might old maps be useful for contemporary urban scholarship? 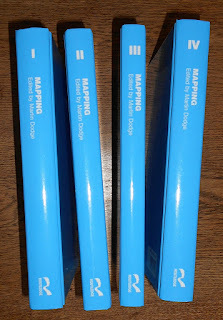 My long-term interests in map artefacts and mapping practices seem to be stuck in the past these days! I have become, to an increasing degree, a historical geographer in terms of my research activities. 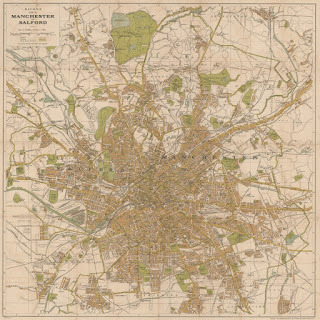 Intellectually, I am engaged in thinking about the role and relevance of visual representations such as maps and map-like spatial materials from the past, within contemporary scholarship on cities, infrastructure and techno-social practice. In broad terms I am mapping out the value of historical cartography, and at the same time working to make more old map and 'technical' plans of infrastructure publicly available through digitisation. 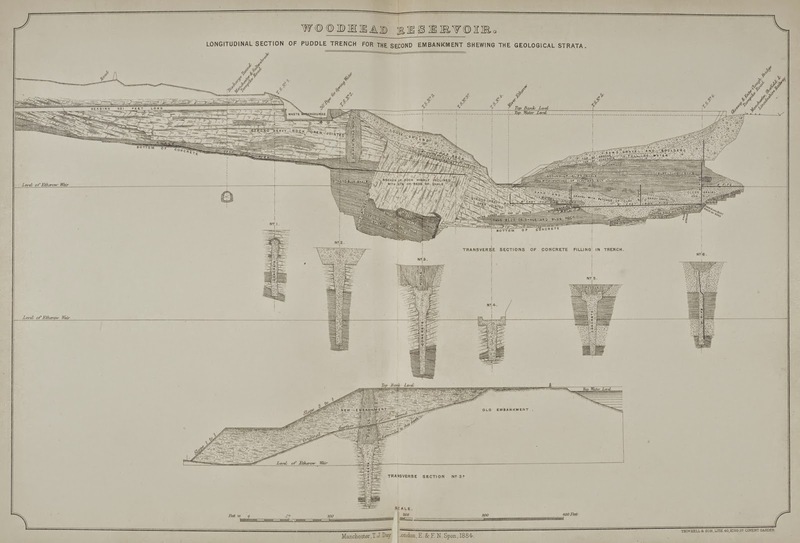 I am trying to think about what we can glean that is distinctive from having free access to many old and original thematic maps, detailed topographic sheets, technical diagrams, engineering plans, historic aerial photographs and paper architectural drawings. Can the ready availability of increasing range and depth historical visual representations reveal unique aspects of the structure of cities not available from other sources? 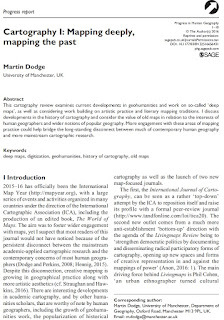 Some of my current thoughts on the latent value locked up in historical cartography and other kinds of 'technical visualities' of the built environment, and how appropriate digitisation can help unlock access and lead potentially to new ways to understand space and place are discussed in a piece I recently wrote for Progress in Human Geography. 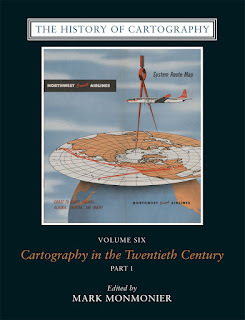 Also related is my review essay for the journal Imago Mundi examining the publication of new monumental historical encyclopaedia, Cartography in the Twentieth Century. 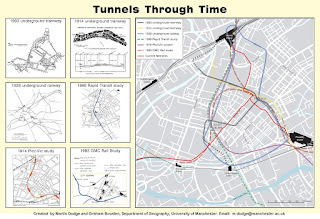 In practice my research on historical cartographies and technical visualities has been conducted in large part through conventional archival methodologies, involving considerable time working in various interesting archives and ‘technical’ collections in Manchester, such as those at the Museum of Science and Industry. 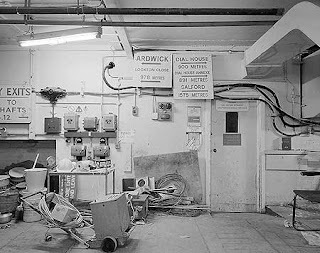 To find particular old maps and original plans for infrastructure in Manchester I have also had to venture elsewhere, including the National Grid Gas Archives in Warrington, the GPO / BT telecommunications collection in central London and the National Archives at Kew. 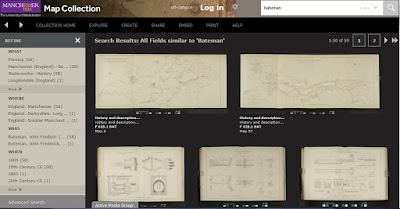 I have also been undertaking a number of digitation projects relating to historical cartography and technical visualities, usually in collaboration with specialists at the University of Manchester Library (UML). Most material digitised concerns aspects of Manchester’s urban geography, transport provision, town planning and infrastructural development during the nineteenth and twentieth century. Some of the key digitisation projects I've instigated in the last five years or so include scanning a set of old maps and original plans relating to the design of the Manchester Ship Canal, encouraging the capture of series of 60 different street directory maps for Manchester city centre from across the nineteenth century and in the early twentieth century (the originals are held by Manchester City Library and are available on their Flickr page or browseable via UML Luna service). 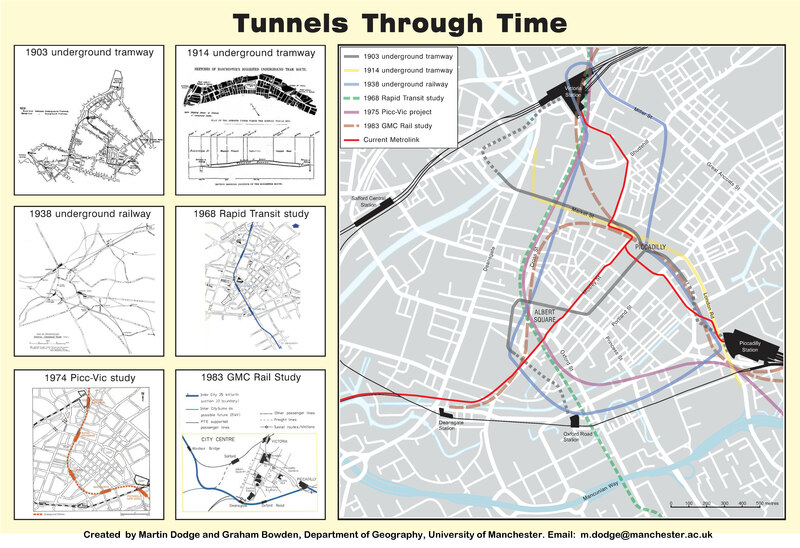 I also initiated the digitisation of bomb damage maps from the Second World War, and put in a lot of work on the scanning and sharing of key official reports related to ‘fifty years of planning the future of Manchester’. 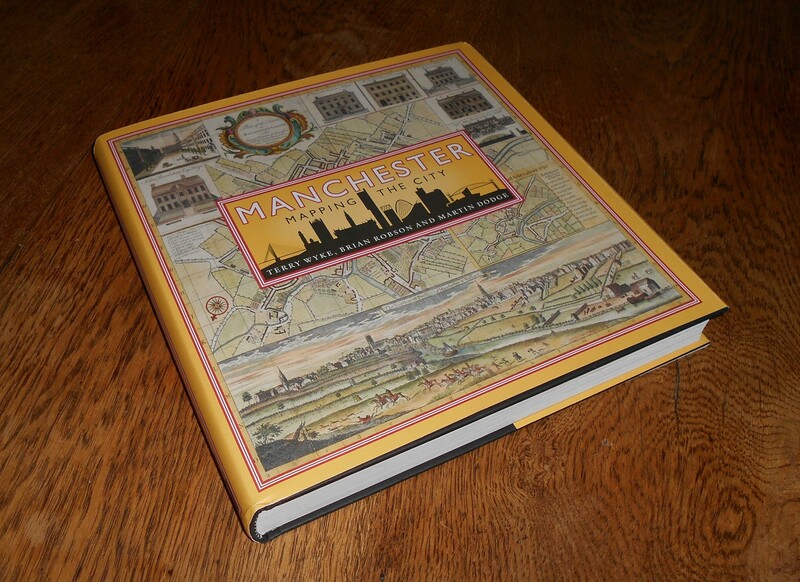 All these digital resources, relating to aspects of Manchester's historical geography, are heavily used by different groups including members of the public and I receive a steady stream of enquiries about them. 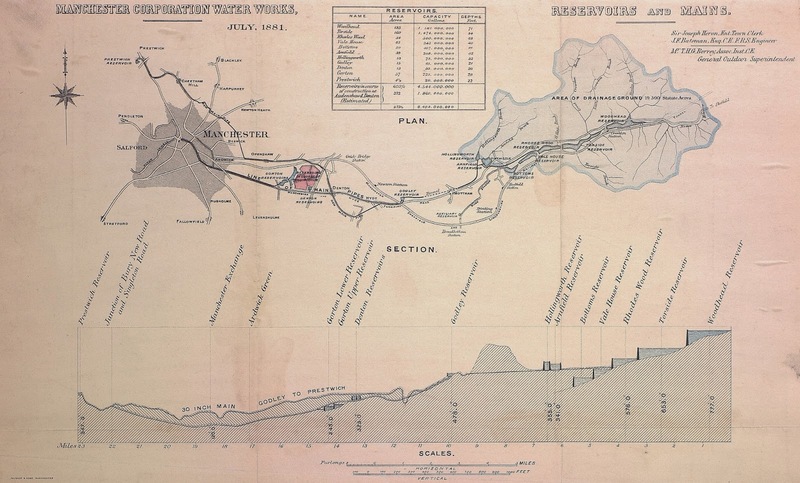 Rather more niche pieces of digitisation that I have instigated relate to infrastructure in Manchester including the railway system and the water supply. The UML have digitised the 1844 ‘Plan and section of an intended railway, to be called the Manchester South Junction and Altrincham Railway’ and also J.F. 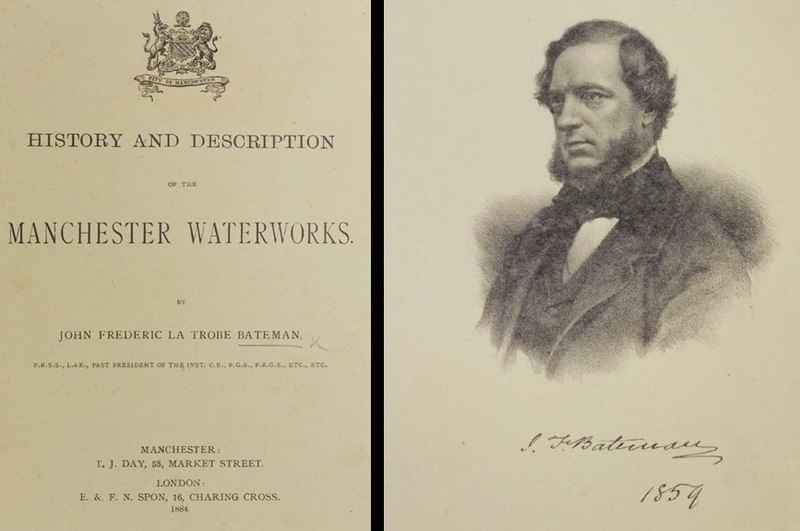 Bateman’s massive book on the ‘History and Description of the Manchester Waterworks’ from 1884, which contains many fascinating engineering diagrams and some useful maps of system design. In collaboration with the Holy Name Church on Oxford Road, I have also digitised some of the key architectural drawings for this Grade I building. 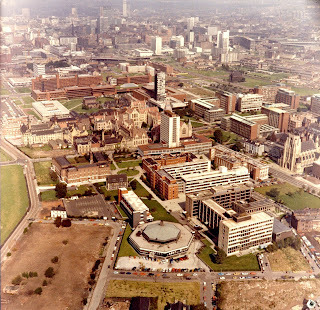 In relation to the history of the University of Manchester, I have served as academic lead on the Campus Maps Through Time project, making the selection of which original archival materials and important historical reports should be digitised. 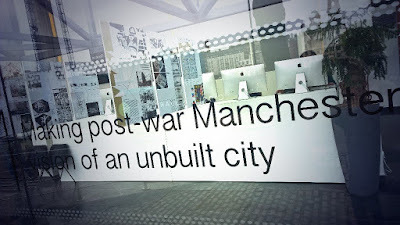 Some of the results of my archival research and digitisation work, which speak directly to the unfolding of urban space, were deployed in the recent public exhibition on 'Making Post-war Manchester' that I helped to co-curate with Richard Brook and the Modernist Society. You can see the range of visual material narrated in the exhibition catalogue, now available freely online. I have been working on a small but significant project to digitise and share some of the original architectural drawings and sketches for the Holy Name Church. The Church, which opened for worship in 1871, is an architectural icon on Oxford Road and is rightly a Grade 1 Listed building. But sadly I think it is also somewhat overlooked by busy scholars and students. Many people spend years at the University of Manchester - myself included - and pass by every day and never look inside nor consider its distinctive Gothic-inspired architectural design. 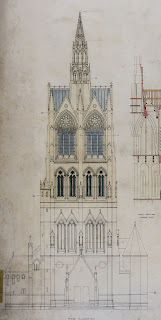 The architectural drawings shed new light on the design and the early history of the Holy Name including the unrealised plans for a tall lantern tower and spire. There are more details on the project in this press release and you can browse all the digitalised images in this Flickr album. 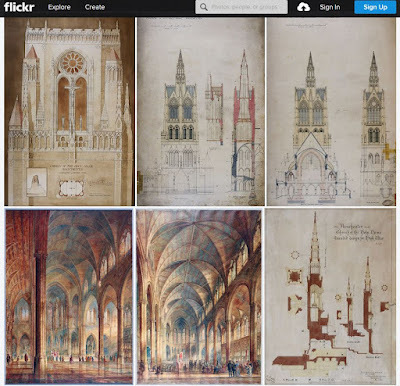 The enthusiastic support of the Church is gratefully acknowledged, including their willingness to release the images free online for wide public access. The digital photography and scanning work on the delicate old drawings was expertly handled by Nick Scarle in the University's Cartographic Unit and logistical support was kindly provided by the SEED technicians in the Geography labs and the Architectural modelmaking workshop. Over the last few months I have been working on a exhibition about planned - but unrealised - urban changes in the 1960s for Manchester. Drawing upon a fascinating range of original sources, plans and architectural models we set out to consider how Manchester city centre could have been transformed if a number of large-scale commercial, educational and entertainment redevelopment schemes had come to pass. The exhibition emerged from an architectural studio project lead by Richard Brook with a talented group of Masters students, working in collaboration with Dr Kevin Tan (MMU computer science game design) and the Manchester Modernist Society. The outline pitch for the exhibition is as follows: "During the 1960s a vision of Manchester was being drawn up by property developers and town hall planners that only existed in architects drawings and consultant’s reports and was never realized in concrete and steel. Manchester was booming and vast swaths of the city centre were scheduled for redevelopment for entertainment, shopping, education, office complexes and transportation. But as with many masterplans, only portions of what was designed were actually built. In this exhibition, for the first time, visitors will be able to encounter the 'unmade city' - the masterplans as they were intended to be." The exhibition opened last Friday and runs for the next three weeks. It has been installed in the glass-fronted foyer of the Manchester Technology Centre right on Oxford Road. This building was formerly known as the 'National Computing Centre' and is an interesting example of a 1960s post-industrial development that planners hoped would help transform the city (and the country). The exhibition site is also within sight of the elevated section of the Mancunian Way, another potent example of the 1960s agenda for radical urban transformation of the city through large-scale transport infrastructure. 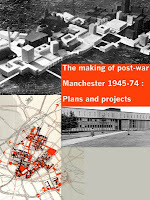 Some more detail on the free exhibition is given on the Manchester Modernist Society events page. At the heart of the exhibition are a set of interactive models of unrealised 1960s era redevelopment schemes for five different sites created by the student teams (supported by Kevin Tan). These are presented in computer game environment that visitors can explore. 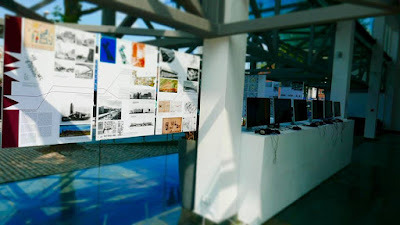 In addition to these 3d digital models, the exhibition includes a series of large visual panels explaining the five redevelopment sites and the various possible architectural solutions that were advanced but unrealised. 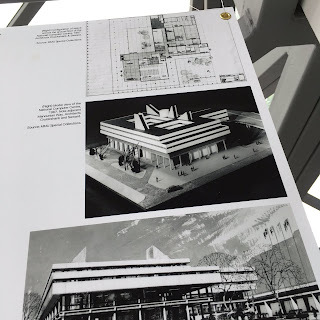 There is also a nice physical architectural model of planned Manchester Polytechnic development and a cabinet displaying some of the original planning reports and brochures from the 1960s. To accompany the exhibition there is a free 60-page print catalogue full of architectural pictures and historical plans. The production of the exhibition has been generously supported by architectural firms BDP and Hawkins\Brown. In particular, we are grateful to Bruntwood who have let us have the space in the Manchester Technology Centre for three weeks as well as funding support. Exhibition location: Oxford House, Manchester Technology Centre, Oxford Road, Manchester, M1 7ED. General admission: June 6th - 24th, 9am to 6pm Monday to Friday (and Saturday 11th June). I was pleased to be able to participant in 'Above. Degrees of Elevation' an international workshop at the University of Edinburgh on the 12th May 2016. It was a stimulating meeting and really well conceived intellectually by the organisers Susanne Schregel, Nina Engelhardt and Nicoletta Asciuto. I learnt a lot, particularly in regards to representations of the 'vertical' in different humanities and English literature contexts. 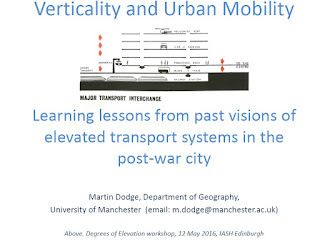 I gave a historically focused, highly illustrated, presentation enitled "Verticality and urban mobility: Learning lessons from past visions of elevated transport systems in the post-war city". The abstract is below and you can browse the slides if you're interested. 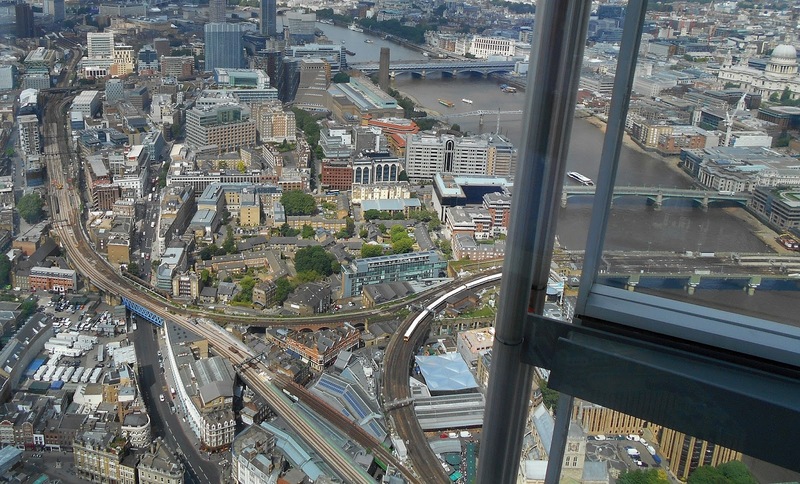 The space above crowded city streets has long been alluring to planners as a solution to the problem of urban mobility. In the post-war decades in particular there were many visions propagated for a revolution in transport exploiting verticality to separate out modes of lateral movement. 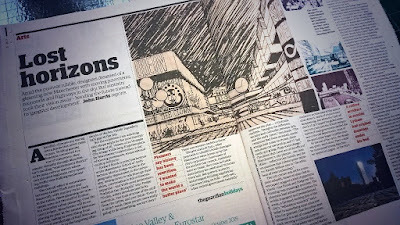 Schemes were proposed for elevated highways carving through city centres, futuristic monorails running overhead and pedestrian decks connecting buildings, along with prospects of helicopters hopping between rooftop landing pads. Using empirical examples from Manchester this talk will consider the potential of some of transport plans, both built and unbuilt, and what lessons might be learnt from their failure to transform urban mobility. What might the modes of failure reveal, in deeper sense, about the possibilities and problems of vertical urbanism in terms of (1) freedom and disconnection, (2) hierarchy and inequality, (3) representation and spectatorship, (4) cost, risks, and environmental externalities? 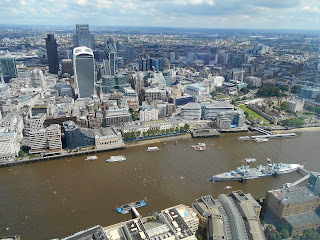 I co-organised, with Richard Brook, a double session of papers at the 16th International Conference of Historical Geographers in London at the start of this month. 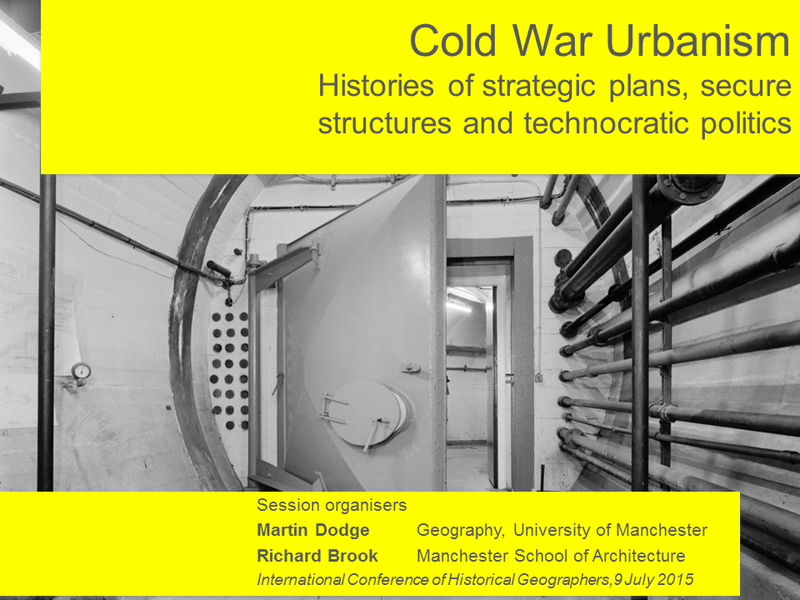 Our session ran on the Thursday 9th July and had six really interesting papers from a range of international speakers looking at themes around strategic plans, secure structures and technocratic politics in the Cold War. I also did an introductory talk and Richard was down to be the discussant at the end. List of speakers and their paper titles is given below. 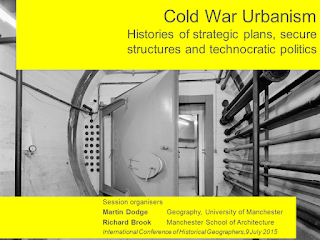 In this session we wish to explore how the threat of nuclear war in the 1950s and ‘60s affected planning at a range of geographic scales. National and international telecommunications networks were built during this time as a direct response to global political conditions. The rise of atomic power and computational technologies required new facilities that were often dispersed and situated variously for secrecy and locally available expertise/experience. 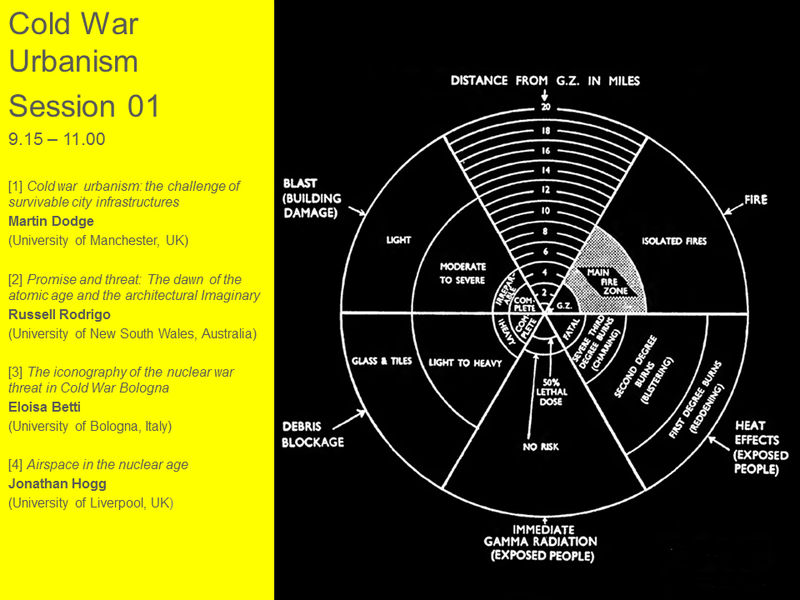 The zoning of land and organisation of facilities and the planning towns is not conventionally viewed as informed by processes of the ‘warfare state’ (Edgerton, 2005), but we want to ask; What were the patterns of the built environment, economic structures and aesthetics / cultures of Cold War urbanism in Britain? 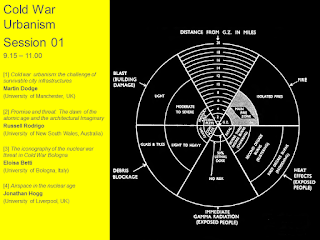 As Boyd and Linehan (2013) state in the introduction to their recent book Ordnance: War +Architecture & Space, we need to be alert to ‘escalation in the intersections between the fabric of the landscape and the technologies of war and the extrusion and mutation of war from the battlefield into everyday life’. 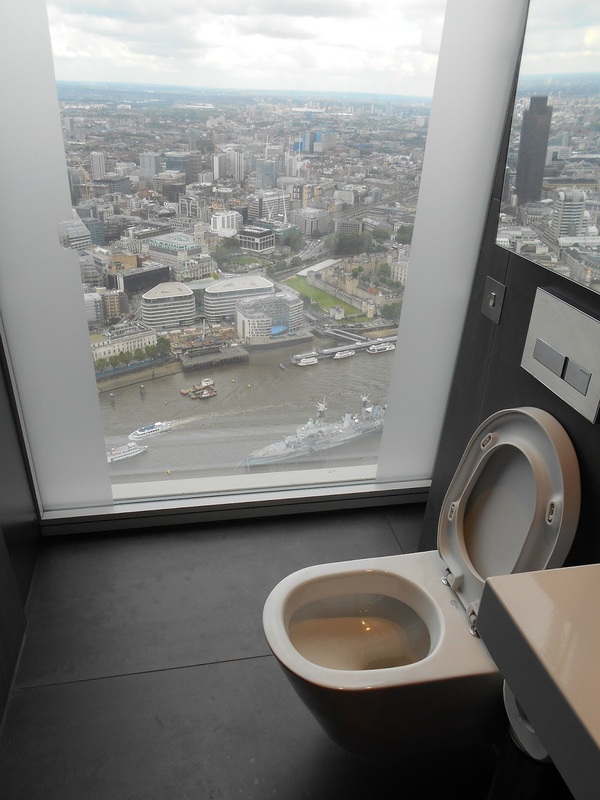 The papers draw on a range of different evidential bases, archival research, personal histories and lived experiences and theoretical ideas to understand the spatiality of technological development, primarily focused upon city scales and architectural resultants. strict linear representation of route way with complete disregard to consistent scale or direction. The strip map can be a very effective means of representing long complex routes in a clear fashion by eliminating a lot of extraneous detail. Despite its utility it is not a widely seen mode of mapping but examples can be found throughout cartographic history, including some ancient Roman examples and well known pilgrimage charts from the medieval period. The strip map came into its own with the development of better transportation from the eighteenth century onwards in terms of displaying turnpike roads, canals and railway lines. The different contexts in which the strip map has been deployed are well documented in another paper by MacEachren and his Johnson. 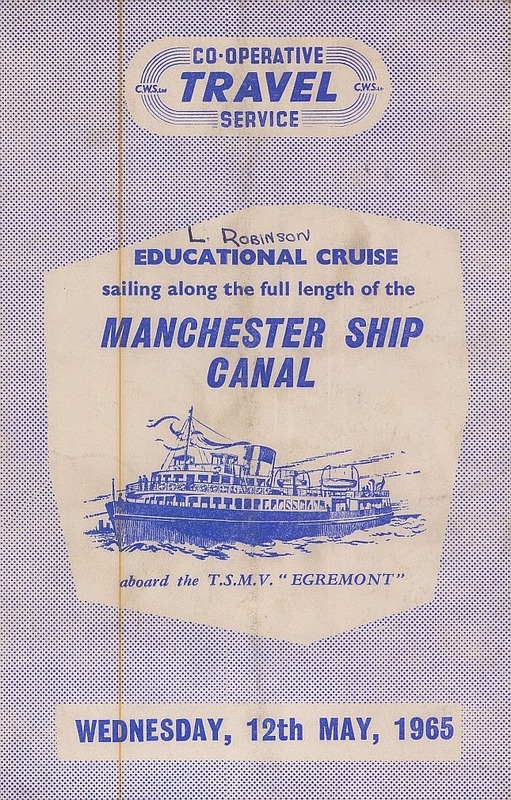 Interestingly multiple versions of strip maps were also published through the twentieth century by the owners of the Manchester Ship Canal to promote its facilities. The linear nature of the 36 mile long canal made it well suited to being displayed in abstract form that eliminates much geographical reality for sake of clarity. 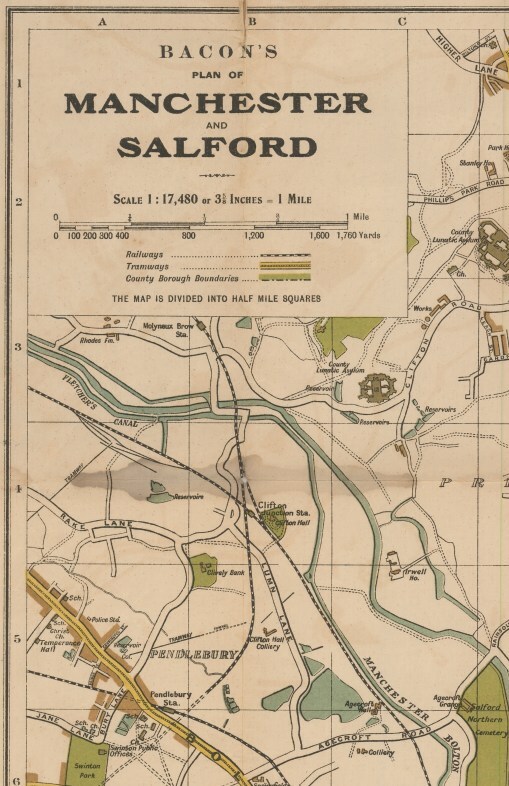 The first example map, shown above, is from 1923 and represents the Ship Canal as a dead straight orange line from the Mersey down to Manchester Docks. All the locks and different bridge crossings are neatly delineated, along with small icons locating important canal side industrial facilities, such as Robertson's Steel Works at Thelwell. (The location of Lymm golf course is also shown for some reason.) Wider loops of the older Bridgewater Canal the River Mersey that accompany the MSC are also depicted. 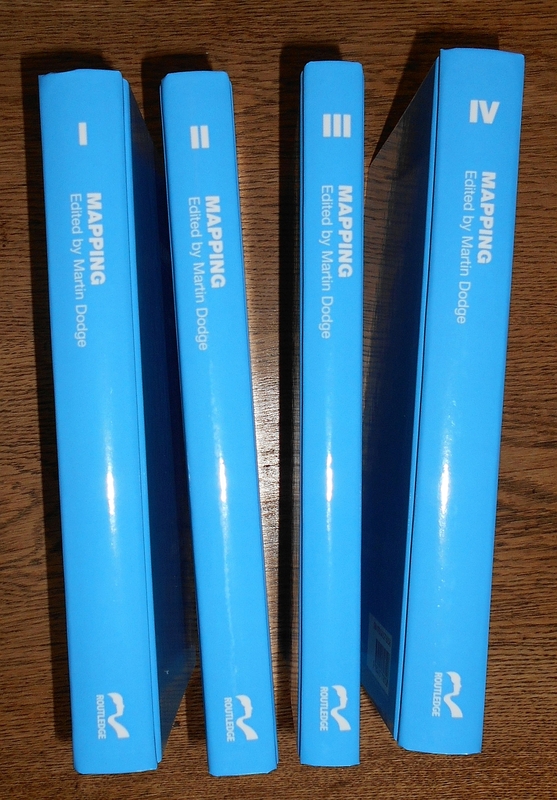 On the left is more contemporary version, described as a 'diagrammatic map', which is packed with textual description parallel to the artificially straightened blue Manchester Ship Canal channel. (Indeed, the map component seems rather constrained by the more verbose text, making it less aesthetically pleasing chart than earlier examples.) Again the multiple crossings and locks along the MSC's full length are carefully denoted from Eastham locks on the Mersey Estuary downwards. Compared to earlier examples, the Queen Elizabeth II oil dock at top of Canal, newly built in 1954, provides a somewhat odd looking addition. There is little coverage of the Bridgewater Canal on this strip map, reflecting its diminished status as a transport route by the post-war period. If you want to see these three example charts in more detail, I have put them together into single pdf: Manchester Ship Canal strip maps. MacEachren A M and Johnson G B, 1987, "The evolution, application and implications of strip format travel maps", The Cartographic Journal, 24(2): 147-158. "whilst many students are Web savvy and adroit in using software, they are largely ignorant of how to produce it. 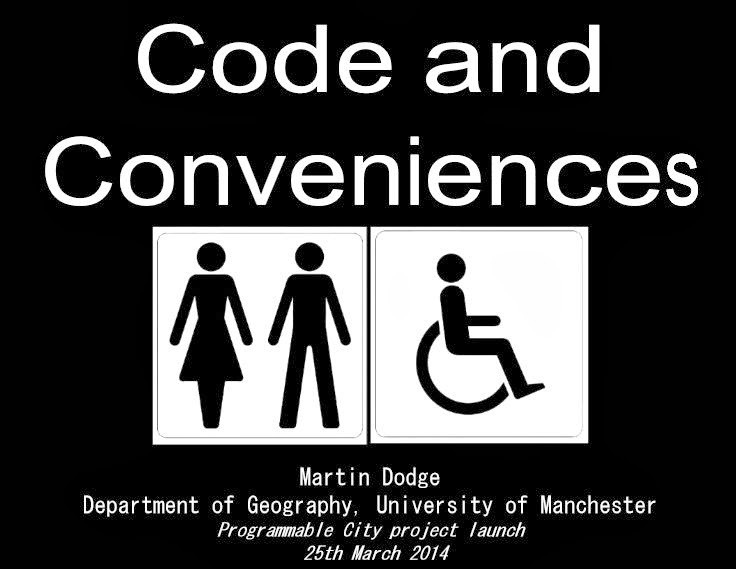 Perhaps then the real follow-on from Code/ Space is need for someone to write a book not on the geographies of code but a textbook to teach geographers to code." 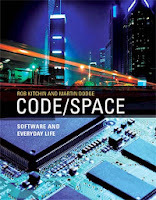 Code/Space has been selling quite well apparently and the publisher MIT Press has decided to release the book as paperback version, which will be somewhat cheaper and will hopefully help it to reach a wider audience. 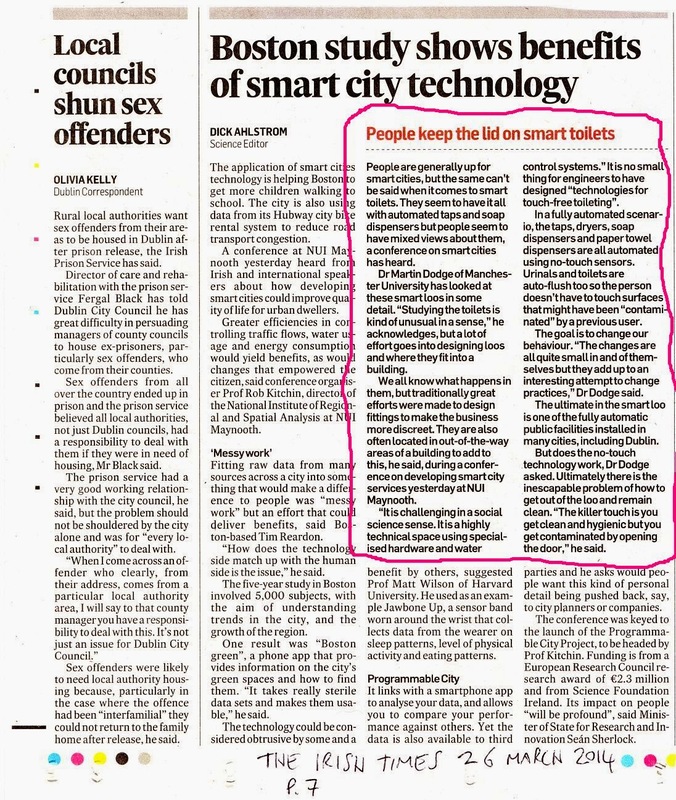 Other related news, Rob Kitchin is developing the code research further under auspices of his large Programmable City project. They have created a new website to disseminate their findings, at www.nuim.ie/progcity/ . Other details are pass code related publications and talks are still on my 'legacy' page. 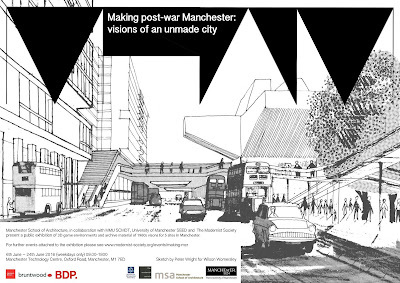 On the 8th May I co-organised a successful one-day symposium looking at urban change in post-war Manchester, with a focus on infrastructure projects and major government plans in the three decades from 1945. 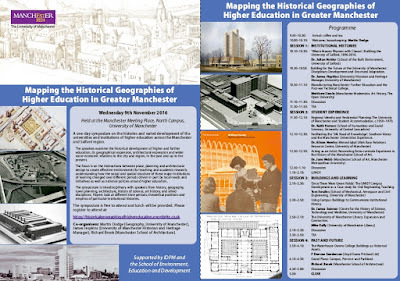 Well over a hundred people attended the event and heard a fascinating sets of presentations from a range of geographers, historians, planners, architects and archaeologists, with well known professors, established scholars and new researchers speaking. The intellectual objectives and the programme of the symposium are given on the introductory slides and other details for the day were laid out for participants in a nice little printed booklet which Richard Brook and myself put together. 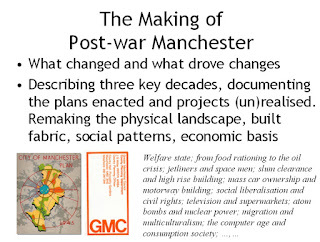 You can also look through the slides for many of the talks given on the PostwarMcr blog. The symposium was made possible with financial support from Cities@Manchester initiative and the Campion Fund of the Manchester Statistical Society. We plan to develop a edited book following the themes of the symposium and many speakers have committed to contributing chapters. 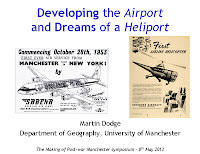 I also gave a new paper on the significance of aviation during the post-war period focused on the large scale development of airport infrastructure in Manchester up to the mid 1970s. This was examined in contrast to the failure of the helicopter to become a routine form of transport during this period and the unbuilt schemes for a centrally located heliport for the city. 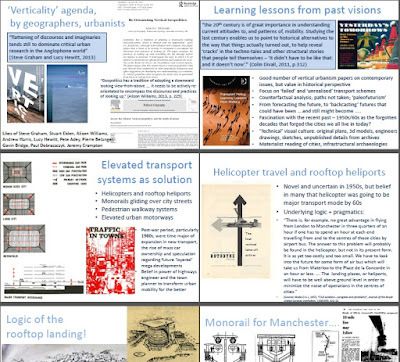 Now I have to write the talk into a formal paper, as well as undertake some more in depth research on the different phases of building at Manchester Airport.